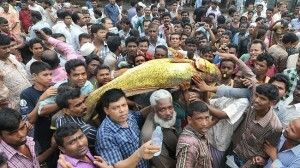 A Chinese businessman has paid $US38,000 (AUD$36,900) for a rare golden snapper in the Bangladeshi port city of Chittagong. The unidentified Chinese businessman from Hong Kong bought the 37kg fish "for its tasty bladder and succulent flesh", Jahangir Saudagar, who sold the fish, said. Saudagar, who works at the Fishery Ghat market near Chittagong port, had bought the snapper from fishermen returning from the Bay of Bengal late on Wednesday. Did you know we have Golden Snappers in Australia too and that many people mistake them for a Mangrove Jack? But you can tell them apart by its prominent black saddle (a 'fingerprint mark')on the tail wrist below the dorsal fin. The Golden Snapper can be found in most saltwater locations in Australia. They prefer tidal creeks and estuaries and can also be found in coastal reefs. They are bottom feeders and hard to catch. Golden Snappers can be as heavy as 8 kg and about half a metre in length. A bag limit of 5 applies on the East coast and the Gulf of Carpentaria. Imagine catching one of those and selling it to a Chinese businessman! Have you ever caught one? Share your story below!